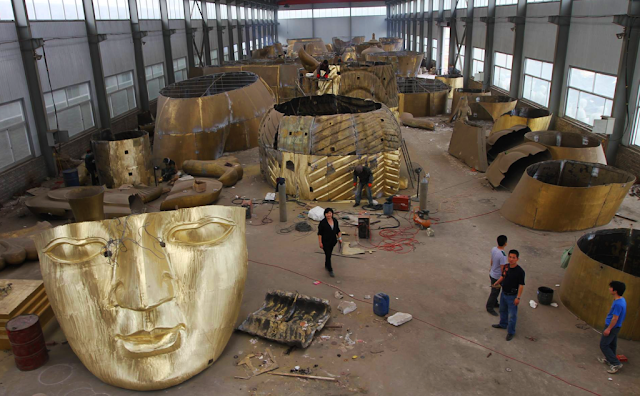 The Grand Maitreya Project statue manufacturing process. Photo via The Grand Maitreya Project on Facebook. A 177-foot-tall statue of the standing Maitreya Bodhisattva will be built in Mongolia under the spiritual direction of the Dalai Lama. The project is set to be completed by 2018 and the builders, the Grand Maitreya Project, are currently holding a funding campaign to help finish its construction. The project aims to rebuild Mongolia’s ancient culture and history of Tibetan Buddhism, starting with the statue of the bodhisattva of lovingkindness, according to the project’swebsite. The statue is meant to act as a beacon of peace, following Mongolia’s complicated history of communist occupation and anti-Buddhist campaigns. The occupation of the country began in the 1920s and was followed by a revolution from soviet communists. During this time, many Mongolian people became separated from their Buddhist heritage, and many of the country’s ancient monasteries and Maitreya statues were destroyed. By 1939 only one monastery was left standing. Following a peaceful protest in 1990, occupying forces retreated and the country re-gained its spiritual freedom. The Grand Maitreya Project itself is indicative of a cultural divide finally being bridged. A stupa will be connected to the statue, housing interior teaching and meditation levels, holy relics and other artifacts. The Dalai Lama has selected sacred relics of the Buddha from his personal collection to be enshrined inside the Maitreya statue. Building large statues of the Maitreya is an ancient spiritual tradition once practiced by high Mongolian and Tibetan Buddhist lamas. It was believed that larger the statue, the more people would learn about its meaning and come in contact with Buddhism. The statue’s construction site is located in a place known as Heart Hill, just outside of Mongolia’s capital city of Ulaanbaatar. The center will represent non-sectarian and international Buddhist communities. The project also hopes to offer free meditation training and educational services for people of all faiths and backgrounds. “I am pleased and happy to know that the main part of the Grand Maitreya project will be dedicated for supporting education,” His Holiness said.